As a university lecturer and specialist obstetrician-gynecologist, my interest in research was stimulated by my desire to improve the lives of women in my society. In addition to my medical degree, I also obtained a master’s degree in public health (MPH) to enable me to address women’s health issues using Public Health strategies. I applied for the TDR Clinical Research and Development Fellowship because of my interest in conducting clinical research in infectious diseases affecting maternal and child health. Prior to the fellowship, I had been involved in some clinical and epidemiological studies as an investigator. However, the TDR Fellowship was an opportunity for me to get insight into developing and conducting clinical trials. For the 12-month fellowship, I was placed in GlaxoSmithKline Plc’s vaccines research center in Belgium, where I worked with the clinical R&D team in malaria vaccine development. I was involved in a phase IIb multi-centre clinical trial to evaluate the efficacy, safety and immunogenicity of the RTS,S vaccine in a fractional dose schedule, where I gained competence in clinical trials operations and study implementation. My supervisor (Dr Opokua Ofori-Anyinam) was of immense help in clarifying my professional and career goals and has become a life mentor to me. However, my experience with the Fellowship went beyond mere acquisition of competencies. I believe it was a defining moment for my career, as it opened my mind to a world of endless possibilities. The TDR Fellowship has enabled me to become a strong leader of a multi-disciplinary team. This is evidenced by the rapidity with which I was able to set up a clinical trial site in my home institution (Babcock University Teaching Hospital, Nigeria) and establish the foundational requirements for an advanced biotechnology laboratory. Thus, I have been able to accomplish in six months what would usually take years. Following the completion of my fellowship in March 2018, I returned to my home institution and had a seamless re-integration into clinical, research and academic activities. I was promoted to Senior Lecturer and was also appointed Director of the university’s Centre for Advanced Medical Research and Biotechnology (CAMRAB). I am accountable for its strategic and operational activities, reporting to my mentor (Prof Oladapo Walker) and the Deputy Vice Chancellor. The research activities of the Centre are comprised of various units, including Clinical research, Epidemiology, Genomic research, Product development, Data management/Statistics, and Health systems research. Having established a project team that pulls together diverse professional fields, we are conducting an EDCTP-funded project on parasite resistance to malaria chemoprevention in pregnancy, of which I am the principal investigator. We are also actively writing grant proposals for research funding. 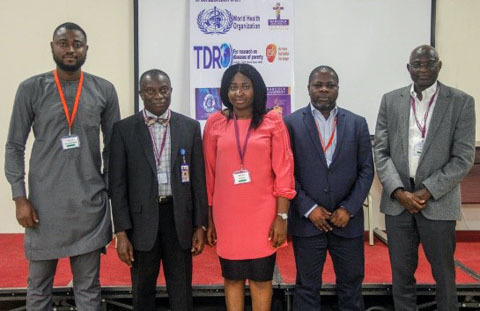 The experience gained through working with the different members of the project team in GlaxoSmithKline (GSK) during the TDR Fellowship has been of immense help in managing my own team now. The exposure and competence acquired at GSK on stakeholder management during the TDR Fellowship has proven invaluable in my interactions with various partners, external laboratories and other professionals. I visited clinical trial sites during the GSK Monitor/Investigator meetings in Ghana and Kenya, and this afforded me the opportunity to see first-hand how clinical trial sites are set up in Africa, and how their processes are organized to ensure operational efficiency and effectiveness. It also provided networking opportunities with experienced trialists (project managers, investigators, operations, laboratory and monitors) whom I can call upon to help set up my site in Nigeria. To pass on the skills gained from the TDR Clinical Research and Development Fellowship in my home institution, I am also focusing on building capacity in clinical research, as there is a significant unmet need for skills and competencies in this aspect. With the TDR re-integration grant, I am organizing face-to-face training workshops on the fundamentals of clinical research and networking for research partnerships for early-stage investigators in my institution. The first workshop took place on 11 October 2018, with collaboration from my institution and industry partners. An unexpected output from the TDR Fellowship is my admission into a doctoral program at the University of Antwerp, Belgium. This opportunity will further strengthen my research skills and position me for a long-term career in the field of research. Leaving my family and job for a year to pursue the TDR Fellowship was a difficult decision, but it was worth it! I am extremely grateful to TDR for providing this opportunity, as the tiny seed sown is already producing fruit.